Attic doors are often left uninsulated and draughty. We insulate all attic doors and draught proof them as standard. 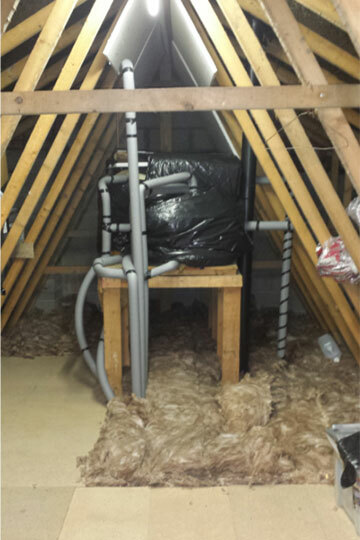 When attic insulation is increased to 300mm, there is very little heat to prevent tanks & pipework from freezing. All tanks and pipework are insulated. Tanks are also provided with insulated covers. Heavy load cables such as mains cables and shower cables are left above the insulation to avoid tripping a switch in your fuse board. Minor cables are safe underneath the insulation. We use special fireproof downlight covers which we can insulate over. These covers also help with air tightness. Where storage space is required in the attic, we can provide flooring. Storage material in attics should never sit directly on top of insulation. As the fiberglass is compressed it loses its υ-value. Joists can be raised & floored so that the area is still adequately insulated (as shown in the picture). Alternatively we can use insulation with higher compressive strength under the flooring.